Rich Rider moves into his new apartment carrying all of the furniture in his two hands. His two roommates, Bernie Dillon and Roger "Caps" Cooper, are stunned as they watch Rich put everything in place with his Nova speed. As he finishes, Rich receives a call from his brother, Robert Rider. Robert has helped Rich set up a messenger delivery and pickup service called Nova Express. The call is to inform him that he has a delivery assignment. As Nova arrives, he is blasted by a mysterious figure who identifies himself as Nova 00. Based on the stranger's appearance, Nova assumes he is a member of the Xandarian StarCorp. Nova 00 also knows Nova's secret identity and informs the Human Rocket that he has come to help train Nova in his "mission". As part of the "training", Nova 00 uses an Electromagnetic Static blast on the hero. The blast stops its target's motion in relation to the rotation of the Earth. As a result, Nova finds himself knocked twenty-five miles away after only a two second blast. Nova 00 follows up the blast with an overwhelming Gravimetric Pulse and a Nova-force generated seismic ripple! As they battle, Nova 00 tells Nova he is not an alien member of the StarCorp, but a human. Rich concludes that Nova 00 has been sent to replace him and fights even harder! Nova 00 is not fazed and tells his counterpart he is here to make him a better Nova. If he fails, the world will be destroyed by a future menace. Nova 00 ends their fight with a devastating knockout punch! 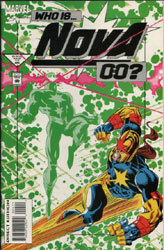 As Rich begins to revive, the mysterious Nova 00 explains his mission to Nova's Earth. He tells his counterpart the tragic fate of his own universe's Earth. Nova 00's entire Earth was incinerated by a powerful force that he could not stop. Nova's universe has its own version of this force and it is headed towards Earth. Nova 00 tells Rich that he must be a better Nova than he is in order to protect the planet. Nova asks Nova 00 about his true identity but receives no answer. The mysterious Nova 00 leaves without a word. Meanwhile, on an island in the North Atlantic, the mutanted animals known as ani-mates are busy helping a seemingly normal condor. The ani-mate named Bird-Brain activates a high-energy machine and states the bird who was once a man will be one again!